It’s the most time-consuming content to create. But it’s the most valuable content you can publish. If you’ve done it you know, conducting original research is hard work. But the day you finally publish isn’t the end. It’s the beginning. Without a plan to drive traffic, your amazing research study might as well be on a dusty shelf in a college library. How to get the word out? Here is our original research promotion playbook, with 29 ways to promote your original research. 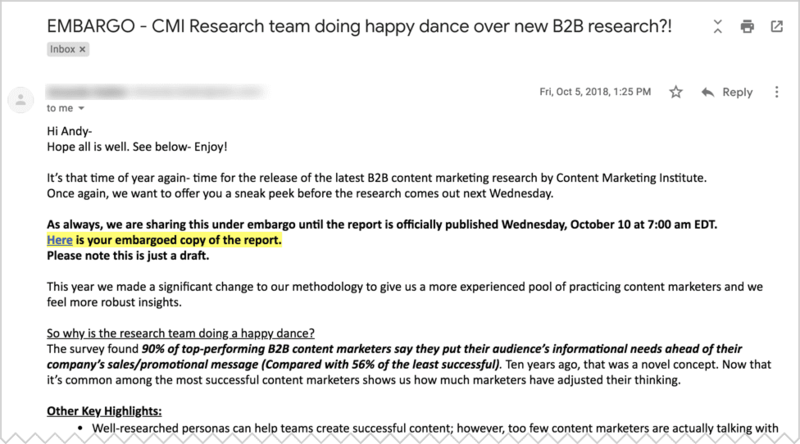 Note: You are reading part two in a series about original research in content marketing. If you haven’t yet, go read part one first: 5 Examples of Original Research in Content Marketing. Before we start promoting, make sure everything is ready for maximum exposure. These first few tips are handled during the publishing process. Because the research will be date stamped with the year, if you publish in January it will look current for 11 months. If you publish in November it will start looking old in just a few weeks. It needs to be an HTML page, not just a PDF. Why? PDFs don’t have Analytics tracking code; if it goes viral, you’ll never know. PDFs don’t have share buttons; the only way to pass it along is as an email attachment. PDFs don’t have email signup boxes; even if the reader loves it, how can they get more? PDFs are print-friendly and make nice downloads, which make them great companions to HTML pages. They are popular lead magnets. But nothing built for marketing should be a PDF only. Make a web page. And make it public. If you keep the research un-gated you’ll see more traffic, shares and links. This makes them legible and clear in social streams. Test this by sharing the page. The “social snippet” should have an image that looks good and teases the research. How can we get industry leaders to see our research? 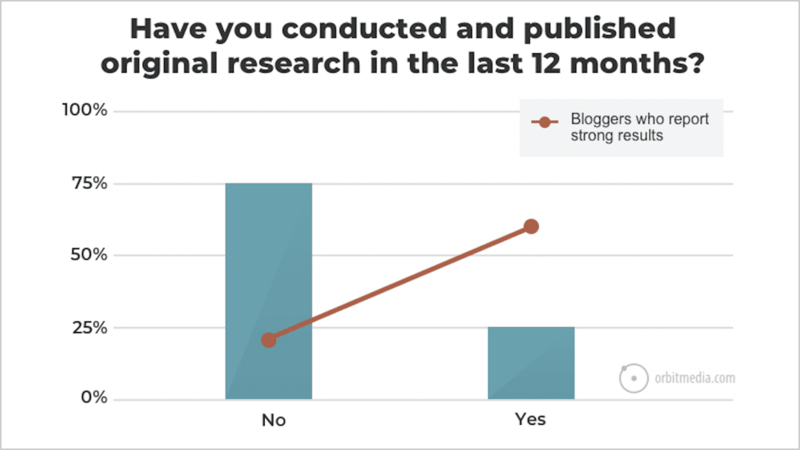 Solve this problem before you publish by putting those influencers into the research. If you wait until you launch and they start asking people to pay attention, it’s a bit late. If you make content collaboration part of your promotion strategy, you’ll have both better content and better traffic. When we work with other publications, we can easily double our reach. Co-brand the research and collaborate on the promotion. Buzzsumo does this beautifully. “Working with another brand or publisher has produced great results for BuzzSumo. It’s allowed us to maximize the ROI on the time it takes to generate, clean and analyze large data sets. The data discovery and analysis is the most time-consuming part of the process, so it makes sense to stretch that resource into as many articles as possible! 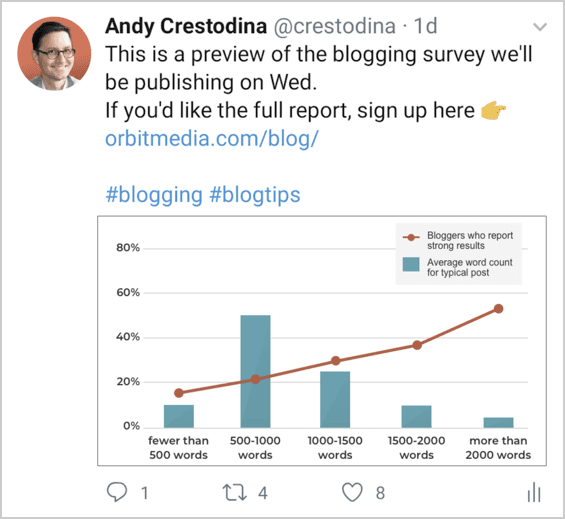 Quick example: Our own annual blogging survey is called Blogging Statistics and Trends: The Survey of 1000+ Bloggers …it’s optimized and ranks for “blogging statistics.” It attracts around 1000 visitors from search. “Many writers, bloggers and journalists rely on Google to find stats, data and research. They will perform an “intent to link” query, such as ‘content marketing statistics’ with the goal of finding a current and reputable source to link to in an article they are writing. Now that it’s ready for launch, take a few extra steps before you publish. The idea is to build up interest in advance. These steps are neither difficult or time-consuming. You can “prime the pump” by sharing a preview of the data a few days prior to launch. This post can include every trick from the social media post checklist and the call to action is subscribe to the newsletter. Everyone likes to feel special. If you have a list of relevant content creators (more on that in a minute) you can give them that feeling of exclusivity and early access by sharing the research prior to launch. Content Marketing Institute has always been great at this. Who can resist a sneak preview? The goal is to get lots of coverage the day it goes live by giving content creators a little time to write about it and fit it into their publishing calendars. Offer to provide quotes, an interview, additional data, etc. It’s especially effective if you’ve invested in relationships with these bloggers, editors and journalists in advance. It’s a great way to build buzz. Naturally, we’re going to send it to our list and share it on social media. But there are ways to go above and beyond. We save this tactic for extra-special content such as a big research piece. It’s a bit aggressive so be careful not to overuse this approach. Send an email with your list. Three days later, send a second email to those who didn’t open the first, with a different subject line. The second email won another 150 visits, which is 37% more traffic from email without much time or effort. This works only for surveys. If the survey was conducted online and the final question asked if they’d like to see the results, it’s easy to pull the list and send this group an email. Anyone can click a share button. Better marketers write compelling posts. The best marketers make short video commercials for their content and post them in social media. And our research deserves the best. It’s 10x the work with 100x the results. 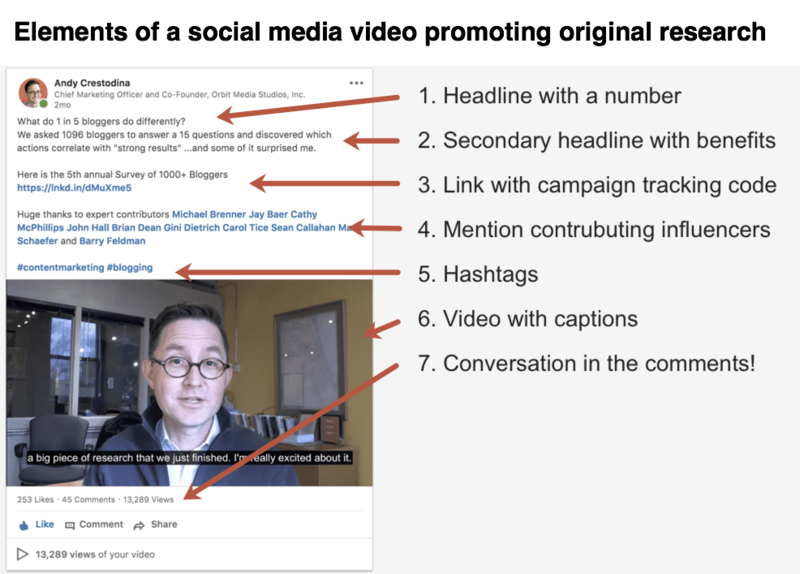 Here is a detailed post with step-by-step instructions for making social media videos. Organic reach in social media is down and still declining, some sources show it’s as low as 2%. So if just one in 50 followers will see your post, clearly you should share it more than once. 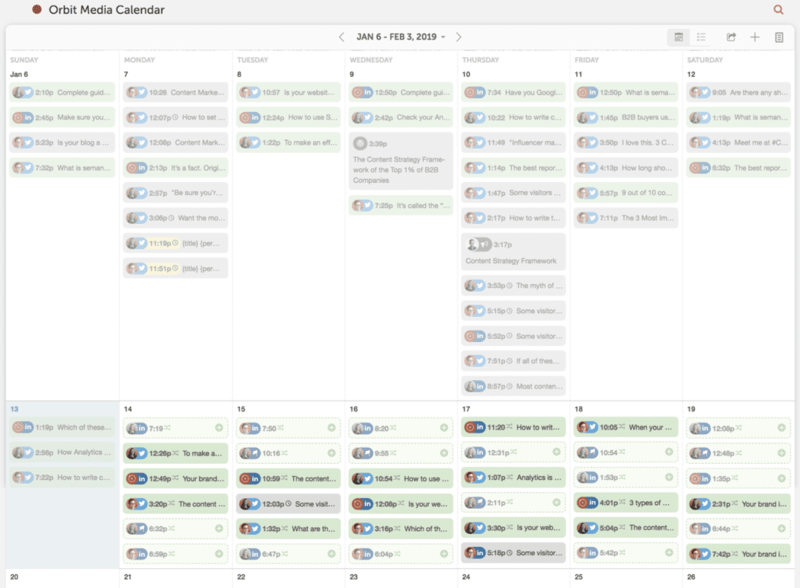 This is what a calendar of scheduled social posts looks like using CoSchedule. You can see multiple posts per day across several accounts. A major piece of content such as original research is set up for a series of posts, starting with several per day for several days. Then several posts per week for a month or so. Finally, it will be kept in rotation with several shares per month for the rest of the year. If that seems like too much, you probably haven’t tried it yet. Ask a pro. This kind of schedule is actually pretty tame. Here’s a great way to get a bit more social traction as you share across several social networks. Several days after publishing, we should have at least a few comments on the research and a few shares on social media. Find those people either by entering the URL into Buzzsumo or just by watching and listening. 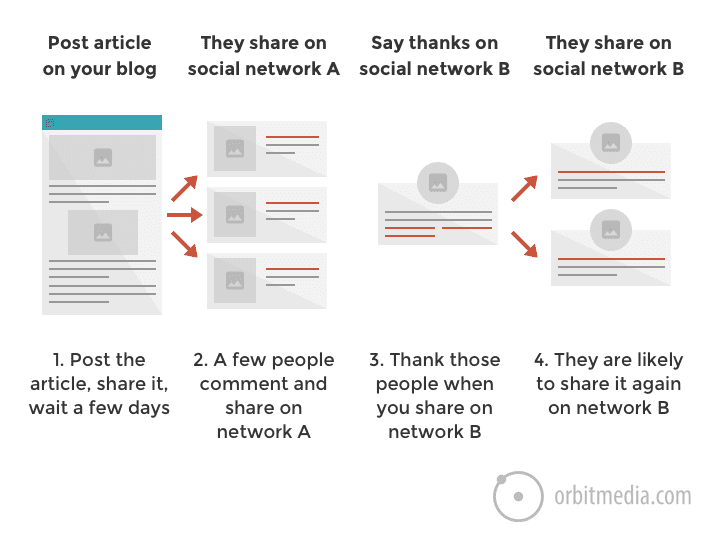 Now share the article on a second social network (even if you shared there once already) and this time, say thank you to the people who shared and commented. Mention and tag them so they are likely to see a notification. They are very likely to share it again on that second social network. It’s a fast way to both improve social media traction and grow your network. Promotion is easier when we have a few allies that we can reach out to a private social network (Facebook group, Slack, etc.) Simply ask people to check out the research, then comment or share if they found it useful. Even better, rather than sharing the link to the research, share the link of the social media post. Ask that they quickly interact with it with a like or comment. 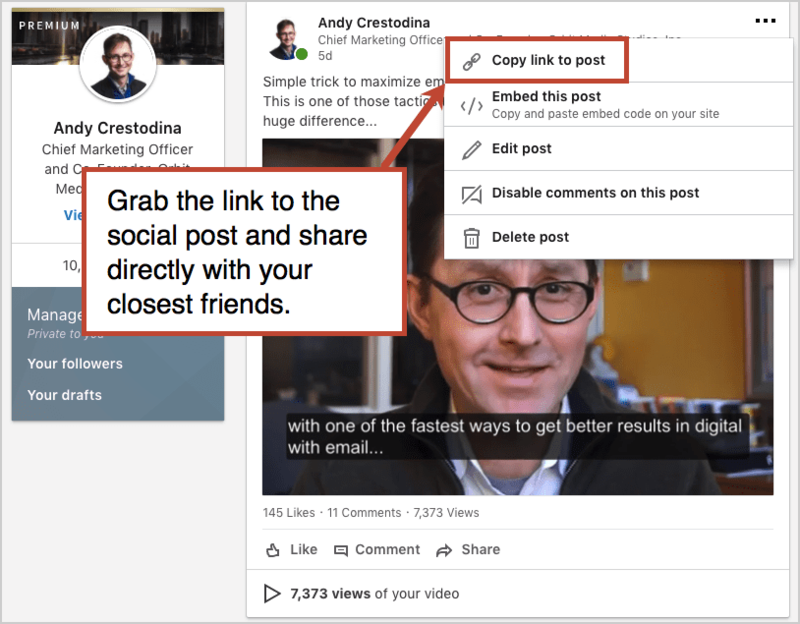 This is especially important for LinkedIn and Facebook, where early engagement on social posts determine how many people will see it in their streams. Trigger the algorithms by sharing the link to the social media post in private social networks! Now we go beyond traditional promotion. Relevant research makes our other content more credible, but only if it’s cited. So we’ll to go back and review articles we’ve published in the past and ask ourselves if anything is related to our new study. This includes articles, blog posts, white papers, case studies and presentations. Add any relevant charts to the older content, link to the new research. You’re not done promoting something new until you have linked to it from something old. If the research answers a question, the question is probably somewhere on Quora. If it’s there, respond to the question with a summary of the research. 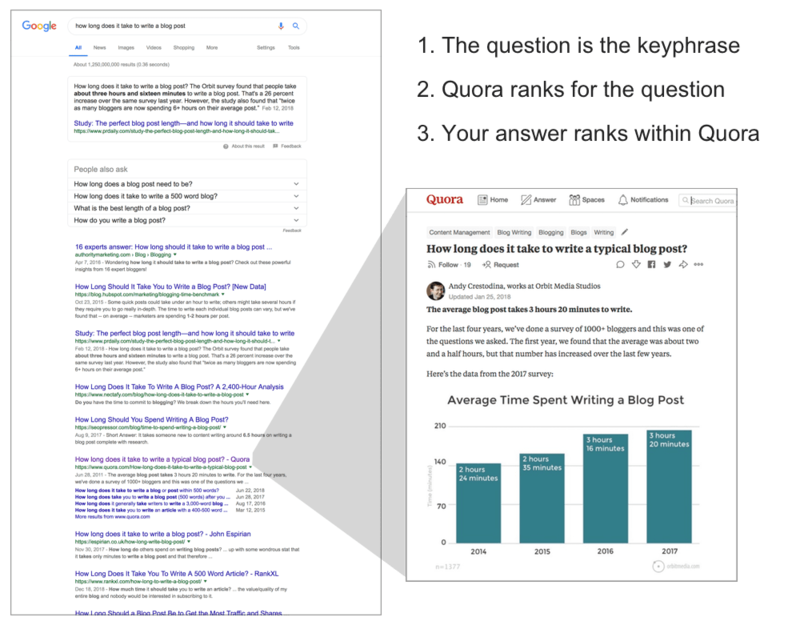 This is more effective than you might think because Quora ranks so well in search. If the Quora question ranks in Google, and your answer ranks in Quora, then your research suddenly ranks in Google. Here again, it’s helpful to have a few allies who can give our answer a nudge with a few upvotes. But even without that, our answer will likely to well. Quorans (people who use Quora) love original research. After the study has been live for several weeks, we can improve the reach through basic syndication. It’s fast and effective. We’ll simply copy and paste the research into LinkedIn and Medium, republishing it in those places. 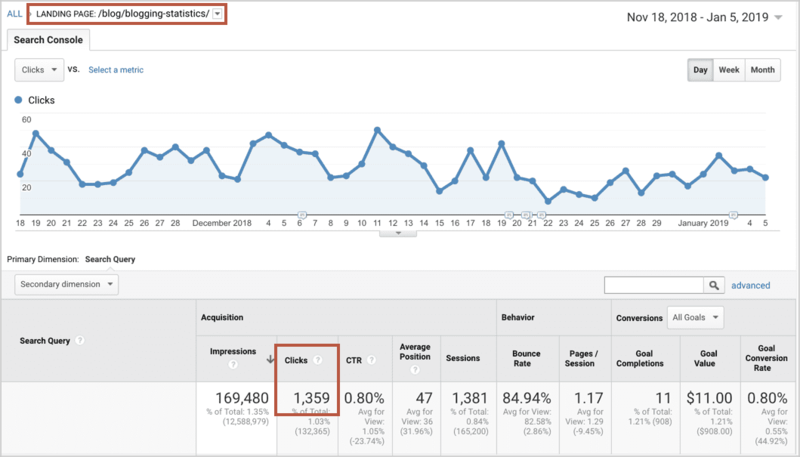 The “duplicate content penalty” is a myth, so don’t worry about a negative SEO impact. There’s really only one downside: these readers aren’t on our site. That means they aren’t in our Analytics and we don’t get the full benefits of shares, links and subscribers. We can minimize this by syndicating an abbreviated version with a strong call to action to visit our website, where they’ll find a more detailed version and additional insights. A printed version can be mailed, left behind after meetings, given away at events or sold on Amazon. When you hold something in your hands, it has a higher perceived value. NextAfter does amazing research on fundraising optimization. They also run a conference where they present some of their best studies, both on stage and in print. I brought home a copy of Value Proposition Index Study and it’s so good, people keep stealing it from my office. When they don’t return it to me, I get upset. …but please not with mass outreach and cold emails. Spend time finding people who will be genuinely interested. Interact with them on social media before you dump a link in their inbox. 20. 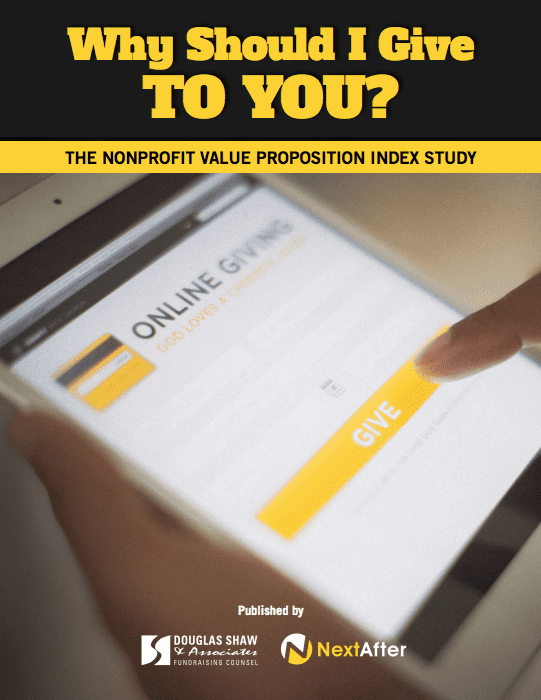 Does the research support someone’s value proposition? Send it to them! These people will get the maximum value from your data, so they’re the group most likely to shout it from the rooftops. Editors and journalists get as many as 10 pitches per day, according to research by PointVisible. It’s hard to break through that kind of noise. But most podcasters rarely get pitched. They have to spend time finding people to interview. It’s easy to offer a little help. Find a few podcasts that cover topics relevant to the research. Listen to an episode or two, then drop them a line and offer to come on the show and chat. They may be thrilled by the offer. Talk about the research and they’ll likely link to it in the show notes. Bloggers who write weekly or monthly roundups of articles are always looking for good content to link to. But don’t wait until the last minute to find them and reach out. Plan ahead. 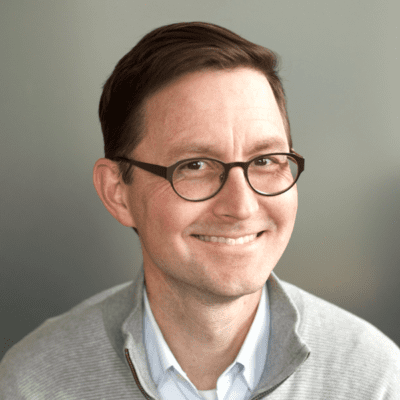 Start building a list of roundups and start connecting with their curators. We’ve published in a promotion-friendly way. We’ve let the world know that it’s here. Now we switch into a reactive mode of listening, thanking and amplifying the mentions as they happen. Set up a Talkwalker Alert for the title, the researcher and the brand. Now you’ll get a weekly email of press hits and blog mentions. It’s a free tool and easy to set up. Highly recommended. As publications start talking about the research, it’s possible that new mentions link back to press coverage, rather than the original on our site. That nice, but those links don’t help our authority and search rankings. Whenever someone links to press coverage, we need to reach out and politely ask that they link to the research itself. Let them know where to find the primary source and why it’s best to link to the original. Be grateful. Reach out, connect with them on LinkedIn and show your gratitude. If you got picked up by a major publication, send a handwritten thank you note. For more ideas, read 21 Things To Do After You Win Press Coverage. Repeating the research the following year means twice the work. But that research is more than twice the value because we can now show the trends. And the promotion is easier because you have more data, more links/authority and more relationships. Every time we repeat this promotion process, it attracts more links and it’s more likely to rank. Not familiar with this idea? Here’s an explanation of Domain Authority. When we share the updated version, we’ll mention influencers who shared the first version. If we didn’t build a list of these people last time, we can find them by putting the URL into BuzzSumo. When we reach out to publications about the updated version, we’ll contact writers who covered the first version. If we didn’t build a list of them last time, we can find them by putting the URL into Moz Link Explorer. Ever heard of Morton Grodzins? Probably not. Ever heard of a “tipping point” in sociology? Probably, you have. But if that idea made you think of someone, it’s a different person with the initials M.G. …Malcolm Gladwell. Grodzins coined the term in the 60’s and not many people noticed. Gladwell wrote a book about it 40 years later and sold 2.5 million copies. Malcolm Gladwell is a household name, while Morton Grodzins sounds like a character from a Harry Potter book. Why do we all know Gladwell and not Grodzins? The difference is in the promotion. So let’s go be Gladwell. It’s not the best content that wins. It’s the best promoted content that wins. Love the exhaustive list of promo techniques (wouldn’t expect anything less), but what do you think about traditional PR agencies? We have some relationships built with them but it seems that nowadays you can pretty much bypass them to get content out yourself via Twitter etc and there are so many bloggers/journalists that the PR relationships don’t matter as much. A good PR firm could be a big help! A lot of these are PR-related so those tasks can be outsourced. Especially if they have relationships with content creators, it could make a big difference. Fantastic Andy. We just did our first study but didn’t have nearly to kind of promo effort it required. This will be our checklist for round 2! Gah, great stuff Andy. Every time I read one of your posts I feel like I have weeks of helpful homework. If only there was more time! One area I struggle with is engaging online groups. Everyone mentions this as an important practice, and I have no problem finding and joining online groups. Connecting through community is great, but a standard rule is to not promote anything, so I’m still having a disconnect between how groups help directly (“share this please”) versus indirectly (We’re supporting each other, and maybe someone will want to learn more about me enough to find me). https://bit.ly/2HxhCAW has helped me greatly in promoting my content as especially as it relates to my niche! I was able to grow my audience exponentially along with adapting techniques you have provided me with, and I want to thamk you for your expertise, you’ve been a great help! !